Expandable garden hoses are space-saving watering tools that will expand in length 2 or 3x and are oftentimes 5x as light as a traditional rubber watering hose (Source). Benefits include a smaller footprint, easier to store, and lighter to transport (Source). The way these expanding hoses are designed, they have 2 layers- an elastic, inner tube that conducts the water and an outer fabric usually built from nylon. The inner tube lining is usually made from latex or elastic rubber- and buyers note that the durability often relates to the quality of the inner lining's material. 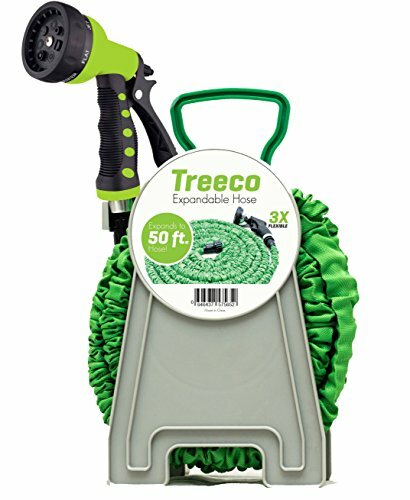 The Treeco expanding hose is marketed as a lightweight, kink-resistant, leak-proof option that's designed for washing cars, pets and watering your garden. It ships with a reel and two, 7-way spray heads. The threaded connectors are designed to resist cracking or breaking. Buyers say that it's a true space-saver, stretching out to 50 feet once you've attached it to a water source. In resting state, buyers say it's about 15 feet long. If you are looking for a light and easy to carry garden hose, you might take a look at this heavy-duty expandable water hose offered by Kona. Users love that the length and the kink-free design of the hose, but some to note that it’s not as sturdy as they expected. 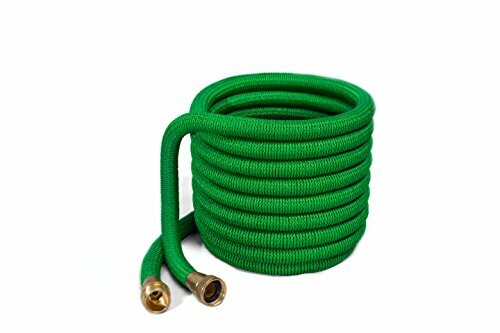 The Kona garden hose stretches up to 50’, and it features a tipple natural latex core for durability, brass fittings with a shut-off valve, and a weight of 2.5 pounds. Another great thing about this heavy-duty expandable water hose is that it comes with an 8-way sprayer that has eight spray settings and an adjustable flow. A purchaser observes that the brass connections are solid and that the hose seems durable and well-made. He adds that it fills and empties fast and that you can store it wherever you want. Another customer states that you have to handle the house carefully to prevent it from damage, but it makes watering the flowers and the trees an easy task. A user adds that the free 8-way sprayer works great and that he highly recommends this as one of the best garden hose. However, some buyers have said that the flexible garden hose is not durable and that it would last only for a couple of months before bursting. This expandable water hose offered by Treeco is well-designed, durable, light and twist-free. Users love the high-quality metal sprayer with eight different settings, but some do note that it’s not very cheap. The Treeco flexible garden hose extends to 50 feet, and it features highly durable inner tubing made of latex, a premium zinc alloy nozzle to prevent rust, and a weight of 2.8 pounds. Another great thing about this expandable water hose is that it’s burst proof due to the sturdy plastic threaded connectors, which regulate the water flow. The manufacturer gives a 100% guarantee plus a 60-day return period. An online reviewer comments that the Treeco expandable garden hose is very light and easy to store and that it shrinks quickly when you stop the water. He also says that the 7-way nozzle is extremely handy due to the various possible configurations and that he highly recommends the hose. Another purchaser observes that the manufacturer provides clear instructions for use and that the hose stretches out nicely. A user adds that he has been using the garden hose extensively for a couple of weeks and that it’s holding remarkable well. The buyer states that the hose doesn’t leak or get clogged and that the nozzle works wonderfully. However, one customer has said that the garden hose burst on the first day. If you are looking for an easy way to water your garden, you might consider this 50ft expandable garden hose offered by JFSG. Users love that the hose is light and easy to store, but some do note that it arrived damaged. 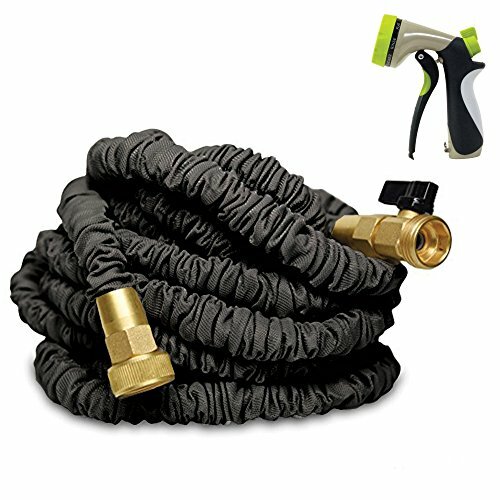 The JFSG flexible hose features heavy-duty brass connectors, triple layer latex design, which is great because it won’t get tangled, a 7-pattern spray nozzle, and a weight of 2.7 pounds. Another great thing about this water hose is that it has a 12-month guarantee. The manufacturer recommends that you use the hose with water pressure below 75PSI. A buyer comments that the JFSG flexible garden hose is easy to move around and that it’s perfect for washing the car in the winter. He advises that when you’re using the hose, you should watch out for sharp edges to prevent damage. Another user shares that this is one of the most durable flexible hoses that he has ever encountered and that the fittings are tight and secure. A purchaser adds that he was very impressed by the kink-free design and that the nozzle has several very useful settings. He highly recommends it as the best expandable garden hose. However, some customers have said that the hose is cheaply made and that it’s not durable at all. Some users also note that the hose started to leak very quickly. This 50ft flexible water hose offered by VicTsing is strong, sturdy, and multifunctional. Users love the design and portability of the hose, but some do note that it’s heavier than they expected. The VicTsing expanding garden hose features solid brass fittings that will withstand high and low temperatures, a conveniently placed built-in shut-off brass valve, a double layer natural latex core, a tough outer weave, and a weight of 2.4 ounces. Another great thing about this hose is that it’s compatible with most spray nozzle attachments and it has a water pressure resistance up to 130 PSI. It also has a 12-month warranty. In general, users have a favorable opinion of the VicTsing 50ft water hose, and they praise its performance and durability. 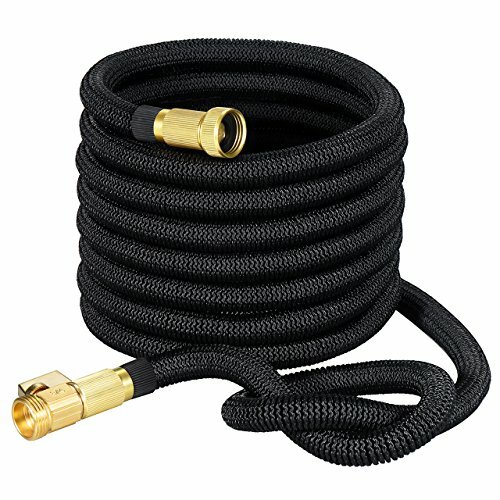 A buyer comments that this hose is more durable than he initially expected and that it’s very easy to carry it around the garden. He also says that it’s a much better option than a thick rubber hose because it doesn’t kink and it’s easy to store it away. Another reviewer mentions that the garden hose exceeded his expectation and that it expands three times its original size. 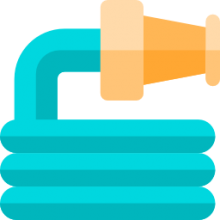 A user adds that he has been using this flexible garden hose for more than a year without any issues and that he highly recommends it. However, some customers have said that the hose gets easily damaged and that it started to leak within a year. Some also note that it doesn’t expand up to 50 feet. This expanding hose offered by LawnTec is durable, light, and an excellent choice for any gardener. Users love that it’s kink free, but some do note that it’s not very suitable for sprinklers. The LawnPro expanding garden hose is made of 5,000 Denier woven wrap for strength, and it features solid copper fittings and steel assembly clamps. It stretches up to 50’, but when you don’t use the hose, it shrinks to under 20’. Another great thing about this hose is that the fittings are replaceable so that you don’t have to throw it away if the threads get damaged. Moreover, it has a 12-moth warranty. An online reviewer shares that he is very impressed with the design of the LawnTec expanding hose and that it hasn’t developed a leak even after several months. He adds that it’s very easy to carry the hose around and that it takes little room when it comes to storage. Another buyer observes that the fabric is thick and seamless and that the hose doesn’t get twisted. A user adds that the copper fittings are sturdy and that it’s easy to drag the hose around the garden. However, some customers have said that the 50’hose started to fall apart after several months of regular use and that it doesn’t stretch as far as they would like. The first expandable garden hose we examined is manufactured by LawnTec. It features a denier casing, steel assembly clamps, copper fittings and is marketed as a compact and ultra-lightweight, kink-free option. Buyers say that you can join two together and they work anywhere traditional hoses work. Another gardener said that her dog enjoyed attacking it until she purchased an auto fetch machine to keep her pup distracted! One homeowner tells us that he went through several of these before purchasing this option- finding that other cheap models were prone to developing leaks and quickly deteriorating over the course of the summer. In addition, he praises how tight and compact it is when not in use, the lack of any water leaks at its joint connections, and the effortlessness with which it glides over outdoor terrain. Another reviewer describes how annoying and messy it is to struggle with heavy traditional rubber hoses- as an alternative these lightweight expanding options feature durable fabric construction which makes them particularly lightweight and compact. Other reviewers tell us that because of how compactly it stores, it looks a lot cleaner in the front yard rather than traditional hoses that when unrolled become unsightly. The second heavy-duty option we examined is provided by Kona Home Products- it features a latex core, brass fittings and promises to be a tangle and kink-free option. It ships with a sprayer, as well, which integrates eight different spray settings. The company also helpfully provides some operational tips, saying that when you are done using the hose, you should always make sure to drain all the water out. Secondly, you don't need to tug and pull on the hose to have it expand, the water pressure itself will perform that. Thirdly, it's best to keep the hose away from harsh and damaging exposure to direct sunlight for a prolonged period of time. Fourth, when you are dragging your hose across your yard, make sure it doesn't travel across sharp surfaces or get pulled tightly around corners. If you suffer from low water pressure, your hose may not expand to its full length- if you encounter that problem, you may want to purchase a longer hose. Buyers offer some mixed feedback for this option, saying that after a couple months of use it sprung a leak. A homeowner we interviewed told us they appreciated the included sprayer head, saying that this lightweight option was a handy complement to heavier, traditional garden hoses- useful for certain tasks in the garden that heavier units couldn't accomplish. With regards to this option, it seems that it suffers from durability issues if you trust online reader reports. One of the common claims is that it's inner plastic tube lining bursts. The third expandable garden water hose kit we examined is manufactured by Treeco. This latex option includes a seven-way metal spray nozzle and a 50-foot hose that includes an integrated latex inner tube lining with zinc alloy nozzles. It's marketed towards gardening enthusiasts who are frustrated having to haul heavy houses around the garden to water plants or even their large-breed dogs. One reviewer says that he hangs it over the outdoor spigot, but also says you can leave it freestanding since it takes up a little room- though it's best to store it in the shade when not in use. This 50-foot option attracted some skeptical purchasers- reviewers were impressed, however, by how easy it was to use, clean, though there was isolated feedback that it suffered from durability issues. A fourth option we examined was the JFSG Outdoor expandable hose. Again, reviewers were somewhat unimpressed, saying that it was prone to leaking. The last option we examined was the VicTsing expandable hose- it features brass connectors and 50 feet of length designed to help you do your outdoor work. While some buyers experienced water pressure problems, for the most part, reviewers say that this is a solid option that has not generated user-reported durability issues like the other options have. Reviewers describe using it to water their hydrangeas, pachysandras, and all manner of flowers and plants in their backyard garden, with another buyer telling us that he used it to help maintain a backyard pond during drought months. Yet another reviewer employs it to wash their car, saying that it truly doesn't kink and that the valve allows you to effectively alter the flow rate as you use it. Buyers say that when not in use, it's about 25 feet long, but when the water is turned on it expands to 50 feet.